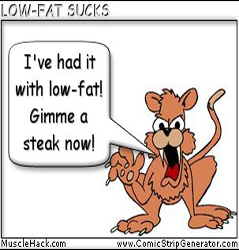 Warning: Low-Fat Diets Are Stupid – Here’s Why! Low-fat diets are so stupid. to strip fat off the body, you should eat less fat. Eating less carbs seems like a strange way to go about reaching the goal. Let me show you why low-carb is actually the REALLY OBVIOUS answer to melting unwanted flab. from your body is to get it to BURN FAT as it’s primary energy source. The way we do this is by limiting carbohydrate in the diet. What’s V8 hot and spicy blend? However isn’t this the same as Atkins? Also I don’t eat read meat…So what kind of food would you recommend? Haha, I thought that dialogue between brain and body was hella funny! You came up with that? That’s so strange in a way… But very innovative! Just curious, how does the heart disease risk change on a low fat vs high fat. I always used to be very low fat, and as a result, very skinny. Now I cut way back on the carbohydrates and fill my tummy with meat, vegetables and fruit and some complex carbohydrates – I make sure to load up my caloric intake, and fat is one way. My question is, by eating more fat, meat in particular, is my risk of heart disease increasing? Are carb-lovers that eat low fat going to be 95 years old while we all die at 50 (albeit lookin’ good?) from clogged arteries? The cartoon is a classic! Great article. I’d get my girlfriend to read it if I thought she’d be open to it. I keep telling her that dietary fat is not the problem. Most girls are so fat phobic – hopefully we can get a few to read this post. Its hard for some to change their tune on fat. Should get a few nutritioniststo read this post too!! Thanks for the advice Mark, your article, along with the comments of others’ diets, have guided me on what I should be eating…I was starting to think my diet was going to be boring now that I’m back at the gym after a 1 year hiatus (and I gained a belly during my sabbatical). Your site is very informative, and I’ve passed it on to a few friends who will benefit from your articles. Great article, and isn’t true that omega-3 fats also help the body regulate metabolism? (i.e. eating fat encourages the body to burn fat for energy.) interesting stuff. As for the explanation – simple and straight to the point. Nice work.